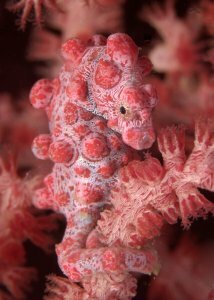 Today’s fish is one of the hardest to find but most beautiful critters you can see on the reef, the Pygmy Seahorse! The Pygmy seahorse, also known as the Common Pygmy Seahorse or Bargibant’s pygmy seahorse, is one of the smallest members of the Sygnathidae family. 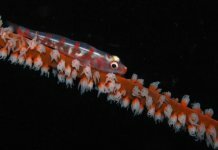 The Sygnathidae family, which contains the seahorses, seadragons and pipefish, has around 100 species in it including 8 different species of Pygmy seahorse. 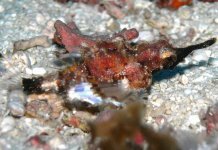 While in this article we will be looking mostly at Bargibant’s seahorse we will also take a look at some of the other species of Pygmy seahorse, such as Denise’s seahorse, Hippocampus denise. The names Pygmy seahorse and Bargibant’s seahorse have fairly simple origins. They are called Pygmy seahorses because they are very small and barginanti because that is the name of the person who discovered them, Georges Bargibant. The genus name, Hippocampus, is a bit more interesting. It comes from two Greek words, ‘hippos’ meaning horse and ‘kampos’ meaning sea monster. The family name Sygnathidae comes from the Greek words ‘syn’ meaning fused and ‘gnathus’ meaning jaws. This describes the long snout that seahorses have, using suction to feed rather than biting or chewing prey. Bargibant’s seahorse can be found throughout Indonesia and ranges as far north as Japan and as far south as Australia. However, much like the clownfish we looked at last time, the Bargibant’s Seahorse lives in a symbiotic relationship with the gorgonian fan, Muricella plectana, and is never found away from it. 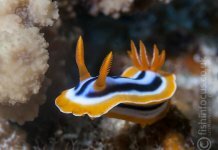 They are both found between 10-40m on reef walls with moderate to strong current. This is due to the feeding habits of the Gorgonian being a little different to those of an anemone. It is currently unknown how many Pygmy seahorses there are, either number of species or number of individuals and as such are listed as data deficient. 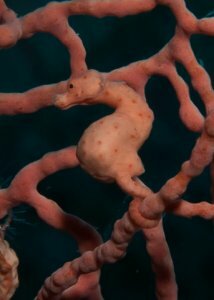 Most seahorse researchers believe that each different species of Pygmy seahorse is related to a different species of gorgonian but scientists have not discovered them all. Yet another project for our budding marine biologists out there, you might even be able to name one! 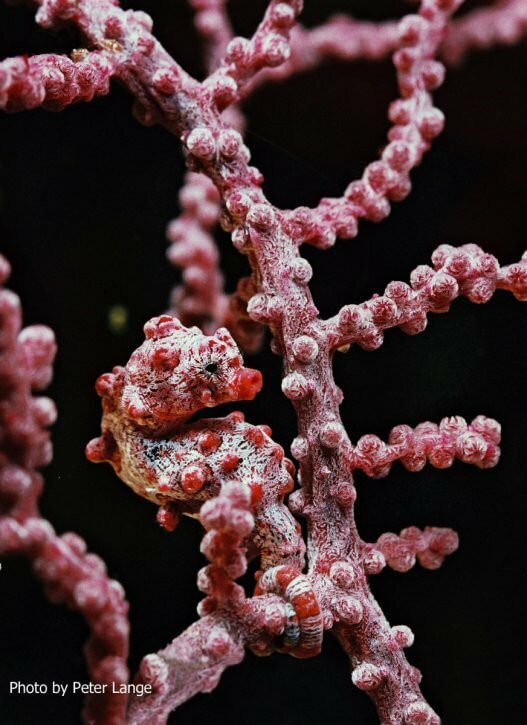 You will never see anything like a Pygmy seahorse, if you are ever able to spot one! 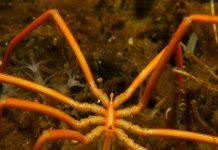 One of the most well camouflaged animals in the sea, they hide amongst the arms of their gorgonian which they match to perfection. They are very hard to spot but the hard work is most definitely worth it! Short, squat and a little pudgy, they are covered in large, round structures called tubercles which match the colours of the gorgonian’s polyps, either reds, pinks or peachy oranges. The body of the seahorse matches the colour of the arms of the gorgonian, somewhere between a speckled grey to pale pink. 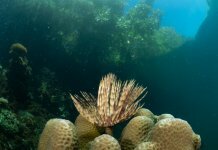 Biologists are not sure if they are able to change the colours of their tubercles based on the gorgonian that they live on, hopefully more research can reveal this mystery. Their bodies appear fleshy rather than the scaly and hard appearance of larger seahorses, which again suits the soft appearance of the gorgonian. Body shape wise they are very similar to regular seahorses with a few slight differences. They have much shorter snouts than regular seahorses and have smaller fins. Similar to larger seahorses however, they have long prehensile tails to grip on to the fans. Due to the strong currents they are often found in, these tails need to grip very tight! So they can snake in between the polyps, the tubercles are reduced or replaced with pinky red spots. One other difference Pygmy seahorses have is that rather than the normal 2 gills on the sides of their heads, they have one on the backs of their heads. By contrast, Denise’s pygmy seahorse, Hippocampus denise, is a much thinner and slenderer seahorse to fit in with its gorgonian. Varying between bright orange to peachy orange, its tubercles are much smaller than Bargibant’s pygmy seahorse. This camouflages it perfectly with its fan, who’s polyps are much smaller than the fan Bargibant’s pygmy seahorse lives in. Just like their larger counterparts, Pygmy seahorses have a unique way of raising their young. The male is responsible for the gestation and birth of the fry and the process is fascinating. After a courtship, which would normally last several days but is reduced in Pygmy seahorses, the female inserts a structure called an ovipositor (essentially an egg laying tube) into the male’s brood pouch inside his trunk. 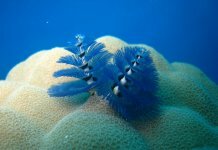 The reason this courtship is reduced is because a gorgonian may only have a few seahorses on it, reducing the amount of potential partners. Using the ovipositor, the female transfers eggs to the male. He then nurtures the eggs, supplementing the yolk with a high energy lipid and calcium blend to increase their growth. Between two weeks to a month later, the male will give birth to the young at night to reduce predation. It is unknown how many eggs are transferred but it will be a large number to account for the high mortality rate of the young. Most larger seahorses transfer around 1000 eggs at a time but it is unlikely that such a large number is transferred by pygmies. After the birth there is no more parental care. 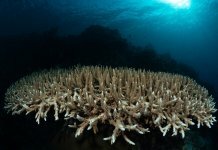 The young, some of the smallest creatures on the reef, have a high mortality rate with less than 10 expected to grow to full size. There are a few reasons they choose to breed this way. Most seahorse species are monogamous, meaning they pair for life. Pygmy seahorses may not be monogamous, however as mentioned earlier there are so few seahorses per gorgonian the choice is often made for them. During the pregnancy the female continues to visit the male and interact with him to enforce their bond. Whilst he is caring for the eggs, she is then free to regenerate her egg supply, ready for the next breeding time. This swapping of roles allows the Pygmy seahorses to breed twice as often as fish that have the female care for the eggs. Another bonus for the male looking after the eggs is that there is no chance of another male sneaking in and fertilizing the female’s eggs. This behaviour is fairly common in the ocean so males do everything they can to make sure the young are his own. Pygmy seahorses are only found on a gorgonian fan. They move along the arms, eating small crustaceans and zooplankton that drift past. Like other seahorses they do not have an intestinal system, they have a basic stomach but not much more than that. Due to this they need to be eating almost constantly. They eat using a method called pivot feeding, where they move their heads very quickly towards the prey and eat using a suction. 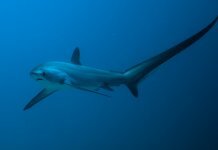 This action is one of the fastest movements in the animal kingdom, ironically possess by one of the slowest swimmers in the animal kingdom. 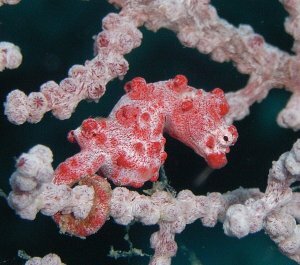 The Bargibant’s pygmy seahorse is one of the largest species of pygmy seahorse at around 27mm long. 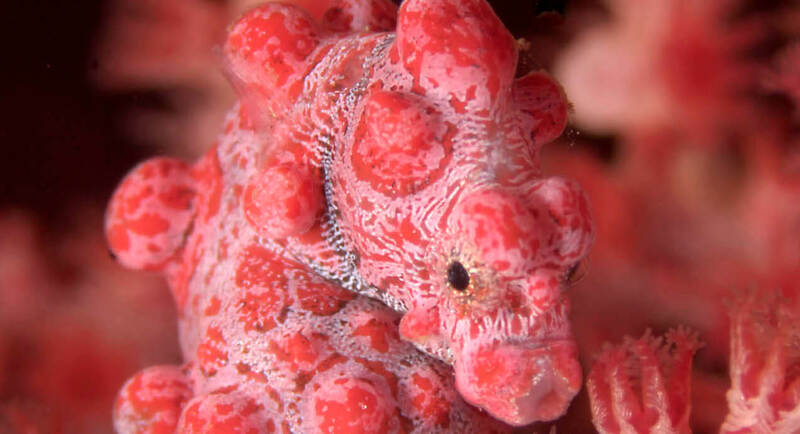 Denise’s pygmy seahorse is slightly smaller at around 24mm whereas the Satomi’s pygmy seahorse, Hippocampus satomiae, is the smallest seahorse in the world at up to 14mm. It is currently unknown what the conservation status of these critters is as we simply do not know enough about them. 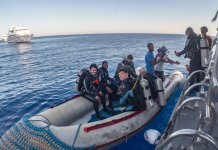 As more divers discover them we will be able to get a better idea about their numbers but in the meantime, assume they are rare and treat them with respect when they are encountered. It took me so long to find my first Pygmy seahorse. Reminding me of one of those magic eye pictures, you can stare at a gorgonian for hours and still never see the seahorse right in front of your eyes. One of the local guides swam over and after 2 minutes was able to point it out to me, making me feel like a real plonker for not seeing it. The trick to spotting them is to look for their deep black eyes and the tails wrapped around the fan. Some people shine a bright light at the fan to get them to move their heads, giving their position away. DO NOT DO THIS! Pygmy seahorses have very sensitive eyes and no eyelids so cannot protect themselves from this brightness. The same applies for photography. Take a bit longer getting the shot right and take one or two perfect images, rather than 1000 shots with strobes to get one good one. I have seen photographers flashing and flashing at Pygmy seahorses with a line of other photographers waiting to do the same. This stress can kill the creature so be a responsible diver and only take the photo once you’re absolutely ready to. All of my encounters have been at depth, around 25m, so keep an eye on your bottom time and air consumption. My other advice would be to bring a magnifying glass with you. A 2cm seahorse on a 2m gorgonian will take a long time to find but it is worth it, there is no better feel good moment than being able to show a Pygmy seahorse to someone! 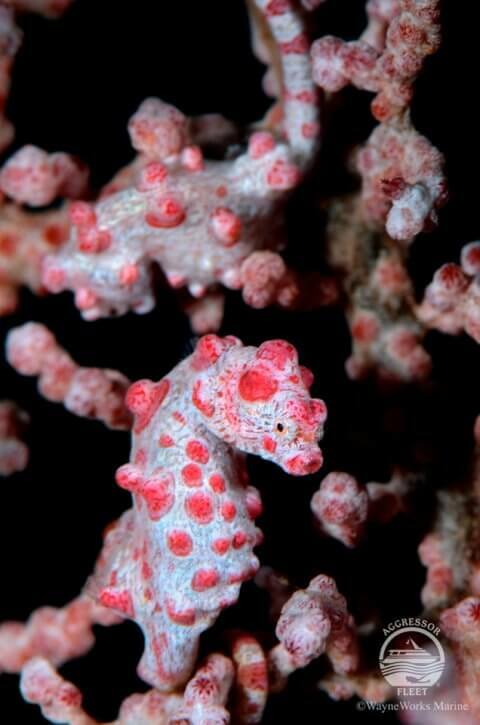 The Pygmy seahorse can be found throughout the Far East. 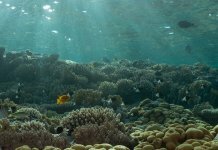 There are plenty of great resorts where you can see them such as Ambon and Lembeh but I had plenty of encounters on Malapascua in the Philippines. 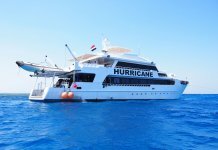 We had them at many of the dive sites there so don’t forget your macro lenses! It might take a while to spot but take the time, you won’t be disappointed. They never fail to make me grin like a joker when I find one, let them put a grin on your face as well!